Mexico sure is a place full of wild crazy things, such as vampires, yeah OK! Robbers-on-the-lam Seth (George Clooney) and Richard Gecko (Quentin Tarantino) take an ex-preacher (Harvey Keitel)and his kids hostage. On a race to the Mexican border, they rendezvous at a cantina, not knowing the owners and clientele are blood thirsty vampires. The film starts out not that strong as a Hostage road drama, and then right in the middle switches gears into an vampire slaying movie. The film stars and is written by Tarantino, as Robert Rodriguez directs in what surely is to be labeled as a comedy-horror film. 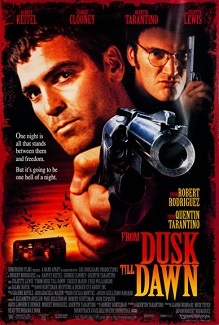 From Dusk Till Dawn is basically a film that has no original content. Much of the content is taken from other films and most of it doesn’t seem original. Many of the features such as one bite and you turn into them and the conventional stab in the heart to kill are all taken from others and basically ruins an addition to the horror genre. Most of the originality starts off in the film and then ends in the middle and then it basically becomes something else we’ve already seen. The film really does start to lose itself by the end of the film and actually started to lose me. I didn’t like the two characters, Clooney and Tarantino, and I really didn’t care what happened to these guys and they never really feel regret for what they have done in the past. When you feel like you just what the two main characters just to die then you have a problem with a film. The film by the last act starts to feel lazy and very tired and the action starts to lag into a very predictable boat. The good things about this film are very noticeable as well. Tarantino does have a knack for a very clever written script and a fast-paced energetic directing job from Robert Rodriguez. They both have a good combination of making a very wise tongue-in-cheek horror action film. The special effects in this film are very good and don’t look like actors in costumes, although that’s what they are. Clooney does an OK job but I will give him his credit since this is his first big movie role. The rest of the cast is pretty good and funny at showing all these opposite people who come together to face vampire’s and actually does prove some good laughs. Consensus: The film is highly energetic filled with over-the-top action that will keep you glued, but I expected more from Tarantino and Rodriguez teaming together and didn’t feel my needs were there.